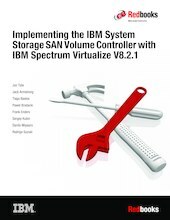 IBM SAN Volume Controller is a virtualization appliance solution that maps virtualized volumes that are visible to hosts and applications to physical volumes on storage devices. Each server within the storage area network (SAN) has its own set of virtual storage addresses that are mapped to physical addresses. If the physical addresses change, the server continues running by using the same virtual addresses that it had before. Therefore, volumes or storage can be added or moved while the server is still running. The IBM virtualization technology improves the management of information at the "block" level in a network, which enables applications and servers to share storage devices on a network.